You can control a smartphone with your fingers; you can control a gaming console with your hands. Obviously, being able to manipulate a tablet PC without ever having to touch the device's screen. That's the premise behind a new tablet by Swedish developer Tobii Technology, which just recently received FCC approval for its "C12" tablet. However, it remains to be seen just how well the tablet will function in everyday use, especially since Tobii's mapped mouse-clicks to the act of blinking – better hope you're not using the tablet with dry eyes, lest you start launching programs all over the place. While it might not make the most sense in a home or enterprise environment, one area where Tobii's tablet could find practical use is accessibility. In fact, this technology can help those with disabilities manipulate the user interfaces of today's PCs as easily as others might use mice and keyboards. According to Wireless Goodness, which first reported about the C12 tablet's existence, the tablet uses eye-tracking software – which users can calibrate, we note – to discern exactly where a user is staring at the tablet's undisclosed-sized screen. Multiple users can allegedly set up their own customized calibration profiles for use with the C12, and the tablet appears to be able to track the motion of individual eyes or the full pair, depending on users' preferences. 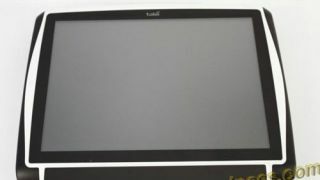 Tobii hasn't disclosed the overall price of the tablet or when it might be available for purchase – let alone any of the other key specifications that might interest those looking to get one. However, it's still a practical application of technology that might fit the needs of an audience that doesn't have many options when it comes to accessible computer use.